The precentor was the obedientiary who directed the church services. He began the Antiphon and the Alleluia for the Offices and all the sung parts of the Mass. According to the twelfth century customary of the Order the precentor stood in the right-hand side of the choir, on the same side as the abbot, presumably this meant he was facing the High Altar, standing in the place now occupied by the Dean in a modern cathedral. The precentor encouraged singing and ensured vigilance during the service. 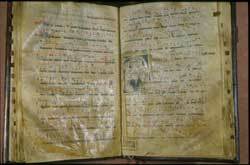 He was also responsible for the liturgical books, and for ensuring that they were in a good state of repair. The precentors office could be stressful and in the early thirteenth century Matthew of Rievaulx repeatedly complained of the burdens of this job and the impact on his health  having led the night office for a month he suffered exhaustion and insomnia, and quite literally felt that he was falling apart. The precentor was helped in his duties by the succentor (subcantor).